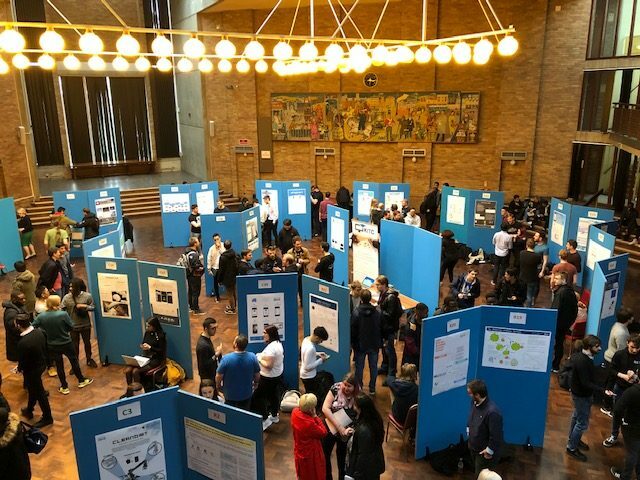 Final year students from the School of Computing celebrated their final year projects at the School of Computing Showcase on Friday 15 March with several prizes sponsored by local companies and partners. The Innovation prize, sponsored by Kent Innovation and Enterprise and awarded to support early stage entrepreneurship, was won by Maaz Mehmood, Praag Dogra, Jack Madden, Stelianos Martis and Dylan Osei-Bonsu for their project ‘Leap Motion’, which interprets sign language for those hard of hearing or unable to communicate and who do not understand sign language. The Best User Experience prize, sponsored by Holiday Extras and awarded to the student who demonstrated an understanding of their end user through an excellent user experience, was awarded to Elina Voitane, Karlis Jaunslavietis, Priyesh Patel and Afzaal Ahmad Razeen for ‘Echobook’, an Echo Parakeet tracking system to help The Mauritian Wildlife Foundation to manage and monitor the Echo Parakeet population. The Most Innovative use of Modern Technology prize, sponsored by Holiday Extras and awarded to the student who implemented modern web/programming languages and frameworks to create their product, was awarded to Christian Dalby for his project ‘Weighter’. Weighter is an Android App focusing on exploring the potential benefits artificial intelligence can have on an individual's fitness by providing users with a convenient and familiar approach to personal training, without the possible intimidation of a human trainer. The prize for the Most Original/Unique project, sponsored by SardJV, was awarded to Aaron Argent, Tom Kawalczyk, Jack Smith, Jamie Swanborough and Molly Walmsley for the Turing Machine Simulator. The aim of this project was to develop and improve an already existing Turing Machine Simulator web application by redesigning and utilising extra space for the simulator, creating a friendlier user interface and adding error messages to create a more accessible and friendly learning environment. The Best Poster prize, sponsored by the School of Computing and voted for by the visitors to the Computing Showcase, was awarded to Joanna Zhang and Damon Sweeney for Coop Control. Coop Control is a platform that accommodates a modular network of devices and sensors that monitor and automate tasks for chicken keepers, from door control to informing the user when the water level in the drinker has fallen below a given threshold. Congratulations to the prize-winners and to all the final year students for their amazing range of projects.